Shri Gaudapada has established by taking as his central authoritative source the Mandukya Upanishad, which though smallest in size (only 12 Mantras or verses) among all the Upanishads yet the most famous one, the following progound Siddhanta by means of logic fully in consonance with Anubhava (universal Intuitive experience): “On the support of Anubhava of Avasthatraya or three states of consciousness, Atman of all of us is verily Ajadvaya Brahman alone which is Nityaniravastha or eternally devoid of any state; That alone is the Paramartha satya”. 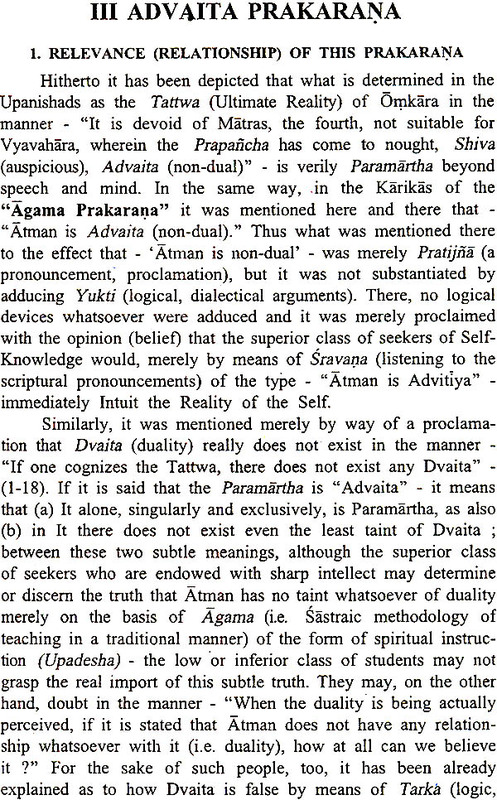 Further, he has not only clarified as to what exactly is the wide difference between the predominantly perverted logic orinted Vijnanavadis and Shuyavada, on the one hand, and Vedanta on the other, but also has convinced all true seekers about the facts that: (a) Vain logic can never stand its ground all through; (b) all the devices adopted by the logically-oriented Darshanas or schools of philosophy are all meant for the worship (Aradhana) of Paramatman. His Holiness Paramahamsa Sri Sri Satchidanandendra Saraswati Swamiji, the founder of Adhyatma Prakasha Karyalaya and author of over 200 reputed works on Advaita in Kannada, Sanskrit and English, blessed the earth with his presence for 96 useful and rich years (1880-1975). His works are characterised by vast and deep scholarship, clear and precise perception and an attractive and lively style. His authentic interpretation of Sankara has been greatly recognized by both the East and the West. He was not just a rare and accomplished individual but a mighty and magnificent institution. Upanishads are an unparallelled treasure of supreme spiritual wisdom. Of all the Upanishads the Vedas include, the Mandakya has a distinct place of excellence and charm. Philosophy intends to probe into existence and knowledge and unearth the ultimate source of both. In other Upanishads the external objective existence is the subject of enquiry, whereas Mandakya presents a distinct difference, which makes it brief but compulsive. The text of Mandakya Upanishad consists of twelve mantras in which the seventh stands paramount. It describes the Ultimate Reality, Brahman, to be the supra - consciousness, distinct from all the other levels of consciousness normally accessible to us. This supra - consciousness is described as "Santam Sivam and Advaitam. This is the Atma and this indeed is to be known" spells out the mantra. To illustrate and explain the process of Sadhana the Upanishad presents the monosyllable Om, relating its three component syllables A, U and M to the three states of man's awareness, wakefulness (Jagrat), dream (Svapna) and deep sleep (Sushupti). The Upanishad's revelations have their own exclusive sanctity and are to be honoured and accepted outright. But whatever the Upanishads present are not without reason and verification. In fact, the entire gamut of Upanishads aim at inculcating in the seeker his own personal testimony for which a full 'Sadhana' is laid down. But scriptural pronouncements, supported by one's own direct experience cannot be without the stamp of reason or 'Yukti'. Only when all the three - 'Sruti', 'Yukti' and 'Anul-hava' (scriptures, reason and direct experience) - blend well the findings become final and unassailable. Assigning reason or 'Yukti' its supreme place in the field of religion and spiritual life, Sri Gaudapada presents three sections of Karika - Vaitathya, Advaita and Alatasanti. By these he first proves, on the basis of relentless reason, the unauthentic, illusive character of the objectivity of our experience. He then established the nondual nature of existence as well as consciousness and finally disposes of all possible arguments against these findings. The Prakaranas of Sri Gaudapada are held with as much esteem and sanctity as the Upanishadic mantras themselves. Unlike in other parts of the world, in this blessed country the philosophers are always ascetics and sages, proving thereby that their philosophical effort is not at all an intellecutal pursuit but a full-fledged religiospiritual mission with the sole aim of realizing the Supreme Reality and thereby fulfilling the main purpose of human life on this earth. Is the objective existence around us true and absolute in nature and purpose? Or is it merely a subject of perception alone? This is the basic question the Karikas pose and discuss. Perception is the outcome of the 'perceiving process'. And 'perceiving' is a process which proceeds from the 'perceiver'. There cannot be an 'action' except when the 'actor' is first there. An 'action' is a phase of expression of the 'actor'. An 'actor' becomes so only when the 'action' proceeds. Before the action proceeded, one cannot think of any actor at all. The twins of 'actor and action' emerge at one stroke. Dissociated from 'action', the 'actor' becomes inconceivable. Something distinct from 'actorhood' and 'action' has thus to be thought of, as the Eternal Presence. The objective world, or objectivity, around us, however huge and imposing it may be, is not a full-fledged or absolute perception, the Karika sets forth. For the duration and condition in which the external objects are perceived, consitute only a part of our life and consciousness. We are conscious of the world, but only during our wakeful state. Wakeful state by itself does not complete or exhaust our consciousness, either its potential or expression. Besides wakefulness (Jagrat), we have two more distinct states. One is the dream (Svapna) and the other the deep sleep (Sushupti). Sushupti or deep sleep is an undisturbed, unbroken long enough state, which does extend to several hours of the day - nearly or more than one third of the day. It can extend even beyond. The same 'I' which remains wakeful and thereby perceives through the senses the objective world, withdraws itself into 'Sushupti', to drop all wakeful perceptions altogether. How can a perception be held true, if it is subsequently nullified like this? The 'I' brings in sleep all by itself, independently, uncomprehending anything else, even the body, mind and intelligence. Besides this deep sleep, we have also the solely inward dream state, which, whenever it transpires, succeeds sleep. The dream state brings in' altogether a new' world, new objects, new values and new responses. Thus the dream state fully contradicts and invalidates wakefulness. Should not the rational man evaluate the objective world, taking his stand on all the three states together? Instantly, objectivity proves itself to be unauthentic and illusory. What is then the ground or substratum of this illusion? If the whole existence around us falls as illusory, its substratum has necessarily to be not anywhere outside, but solely inside. The very '1', which undergoes all by itself the three of wakefulness, deep sleep and dream, and which endures alike in all of them, can alone be and is the substratum for all the states. Everything the'!' produces and perceives is illusory but the I itself is not. That the Self of the' Upanishads which the entire Vedas extol is the only source of creation and is the Ultimate Reality, is what the Karikas argue out and establish. The scriptural Upanishad thus derives a confirmation and enrichment in the hands of the Karika. Swami Sacchidananda Saraswati, a staunch and loyal Sankarite, has written elaborately bringing forth the essential content and message of Sri Gaudapada's Karika and the excellent reasoning set forth there. This work rendered in a regional language has now been made available to larger audience in an international medium by Sri D. B. Gangolli, who has authored a free translation of Swami Sacchidananda Saraswati's original composition. By this a large scope is thrown open by the author which will make Swami Sacchidananda Saraswati's thoughts available to the world over. These days when the Upanishadic, Epic and philosophical thoughts constituing Vedanta are sought more and more by thinkers and students in the world, Sri Gangolli's effort at publishing this book is quite timely and beneficial . 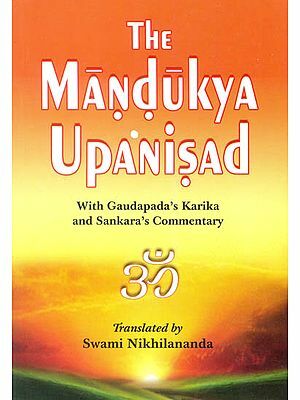 One can hope that his efforts will be properly rewarded and enough of reading and introspection will take place in the field of Upanishadic thoughot, especially the distinguished Mandakycpanishad and Sri Gaudapada's Karika on it. 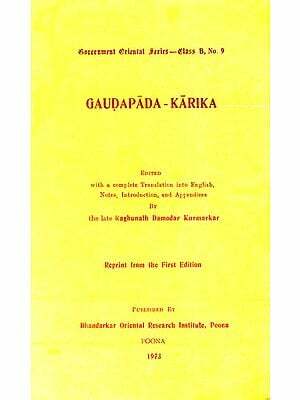 Mandakya Upanishad is incomplete without Gaudapadakarika and proper understanding of the Karika will no doubt make the seeker unshakeable in his spiritual pursuit and the realization of the Self. Soon after 'The Essential Ach Sankara' was published in 1991 by the Adhyatma Prakash a Karyalaya, Thyagarajanagar, Bangalore - 28, the idea of publishing the second of this 'Essential' series, viz. 'The Essential Gaudapada' was mooted. Although the translation of this magnum opus in Kannada by the erudite pen of Sri Satchidanandendra Saraswati Swamiji, of revered memory, was completed by me early in 1993, the publication was put off owing to several causes beyond my control. However, by God's benign grace, I have succeeded to overcome all hurdles and hindrances - most of them could not even be .anticipated - and now this gem of Vedantic science is in the hands of the readers. It is hoped that this will also be well-received by the connoisseurs and seekers alike just as its predecessor - 'The Essential Adi Sankara'. It will also be in the fitness of things to complete this endeavour of propagating the pristine pure Advita Vedanta as expounded by a line illustrious preceptors like Veda Vyasa (Badarayana), Gaudapada, Sankara and Sureshwara who belonged to a time-honowed traditional school of Advaita philosophy. And hence now I have mooted to publish in the near future two more texts of this series to bring it up-to-date, viz, 'The Essential Sureshwara' and 'The Essential Satchidananda'. It is quite well-known in Vedantic circles all over our country that Shri Gaudapadacharya was the grand-preceptor of Shri Sankaracharya, and barring the fomer's 'Karikas', (commentaries) on the Mandukyopanishad there are no other authentic works which are extant in his name. Although Adi Sankara's Prasthana Traya Bhashyas have become world-famous and are exhaustive in their exposition of almost all the rudiments as well as the subleties of the unique traditional (Sampradayic) methodologies handed down over the ages from the teacher to the taught, Shri Gaudapada's Karikas, numbering a mere 215 divided into four chapters (Prakaranas), project the same traditional teachings in a terse and trite verse form. And unless the ardent student takes recourse to the expert guidance of Adi SaIikara's edifying and enlightening Bhashyas, he finds it almost impossible to discern the hidden import of the Karikas. The traditional methodology of teaching was by word of mouth from the preceptor to the pupil in a discursive manner and only the initiated pupils with a pure heart and incisive intelligence could divine and intuit the subtle truths. 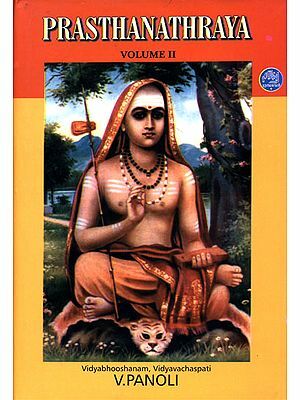 The fact that Shri Sankara in a verse acknowledged Shri Gaudapada as a Knowledgeable teacher of Advaita Vedanta belonging to his line of traditional (Sampradayic) preceptors as well as the fact that Shri Sankara has written an exhaustive and extensive Bhashya on these extant and most ancient (for, no other authentic or authoritative work on Advaita Vedanta by way of an explanatory Prakarana Grantha is available, barring the Srutis, the Smritis and the Brahma Satras - going together by the popular name of Prasthana Trayi) work.. It being so, it is unfortunate that some Vedantins belonging to an alien group and modem scholars with a pronounced sense of an academical study but not trained or prepared to accept even the word of Shri Sankara have raised all kinds of doubts with regard to Shri Gaudapada's identity or whereabouts and have opined that Mandukya is a recent work passing muster as an ancient Upanishad, the author being Shri Gaudapada. 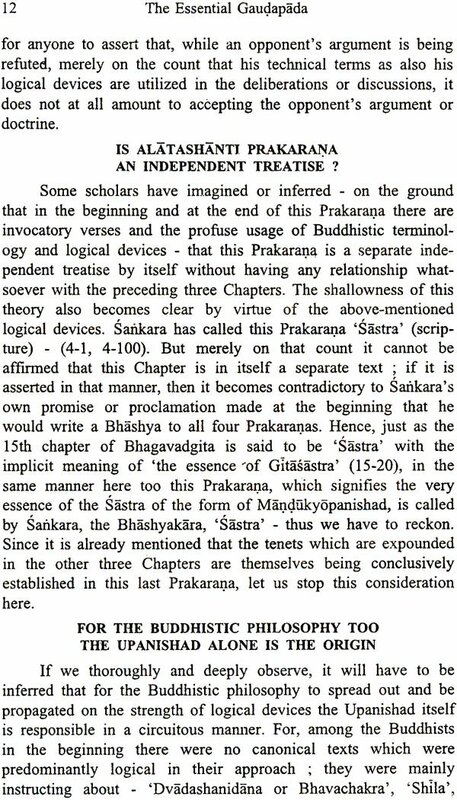 Further, some of these academicians have, quite audaciously too gone to the extent of nick-naming not only Shri Gaudapada but also his faithful glossator Shri Sankara as 'Pracchanna Bauddhas', meaning psuedo-Buddhists marauding as Advaita Vedantins, This they have done on the mere but flimsy reason that the former has literally, sometimes even bodily, borrowed Buddhistic terms and verses and have adapted them to suit their own whimsical theories or tenets. Suffice it to say that all these are wild, unsustainable charges and can easily be dismissed as idiosyncrasies of academicians for each and every such allegation can be disproved (and have been repeated by Shri Satchidanandendra Saraswati Swami, of Adhyatma Prakasha Karyalaya, Holenarasipur - of revered memory) quite convincingly. For more details in this regard the students or seekers are requested to read 'Mandukya Rahasya Vivrutihi' in Sanskrit, (with an exhaustive English Introduction by the Swamiji) published by the Karyalaya. But here is this context some relevant and important details regarding Shri Gaudapada, his works and contributions to Vedanta will be mentioned so as to remove any misconceptions that one might have had because of such false propaganda by the academicians as well as proponents of philosophy opposed to Vedanta. Among the Upanishads that belong to the Atharva Veda, Shri Sankaracharya has written his Bhashyas only on three of them, viz. 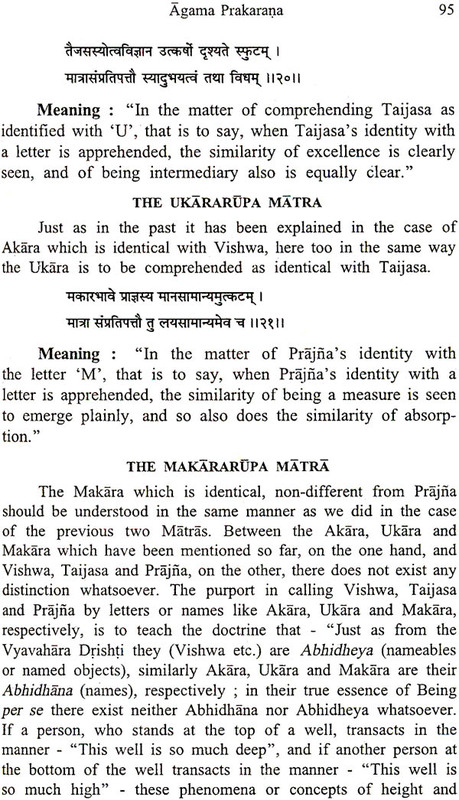 Mundaka, Prashna and Mandukya. Among the three - nay, among all those Upanishads which Shri Sailkara has chosen to write his commentaries on - Mandakya is the smallest. Even so, Shri Sankara has described it as (the quintessence of the tenets of all Upanishads). Since Shri Gaudapadacharya's commentary in the form of 'Karikas' is also written on this Upanishad, we can say - from the standpoint of history of Vedantic lore - that this diminutive Upanishad has a unique importance of its own. 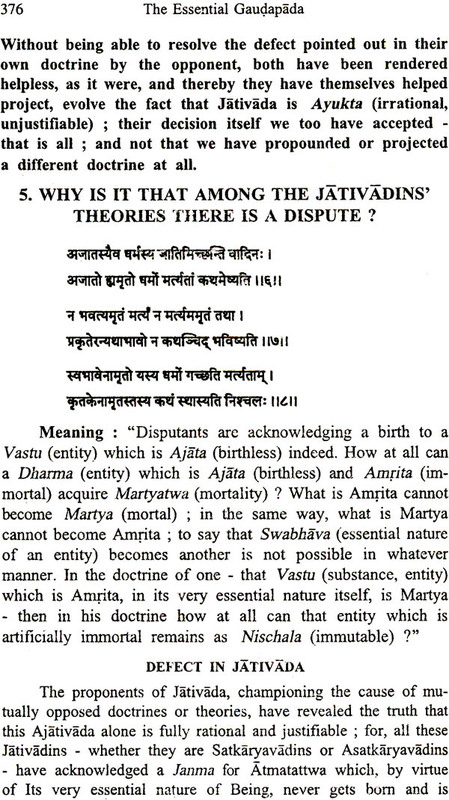 With regard to the question - 'To which part of Atharva Veda does this Upanishad belong?' it is not possible to determine, as there is no clinching evidence available. In this regard, Shri Snlkara has not stated anything whatsoever in his Bhashya. Since the lone methodology of Avestbetbreye (the three states of Consciousness) is to be found U1 this Upanishad through which the Ultimate Reality is determined and expounded, there is a high probability of surmising it to belong to the Aranyaka of that Veda. First and foremost, many Advaitins opine that all these four Prakaranas are written by Shri Gaudapada, who was the grand preceptor of Shri Sankara. 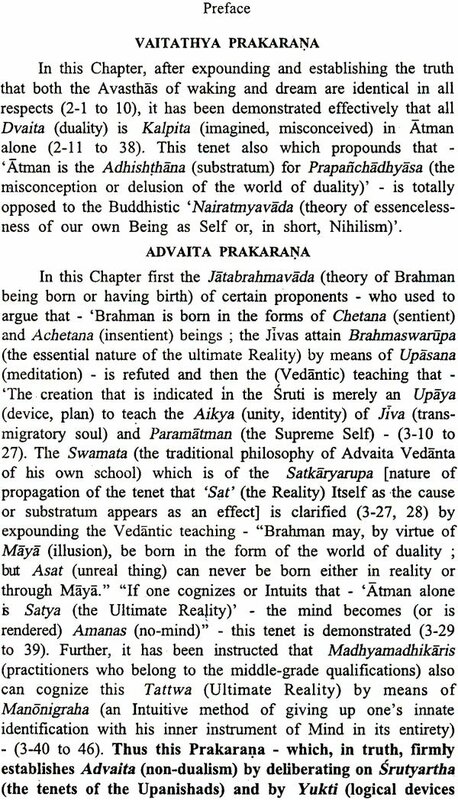 Secondly, Shri Madhwachlirya (the founder of the Dvaita school of Vedanta) has acknowledged that - (i) Agama Prakarana is not at all 'Poutusbeye' (of human origin); (ii) the Mantras, which are seen (heard by sages, who are Brahmajfianis, when they are III commune with the Ultimate Reality) are exemplified in the Upanishad for the purposes of determining Self-Knowledge; (iii) both the Mandakyopanishad and the Karikas are together the Sruti alone. 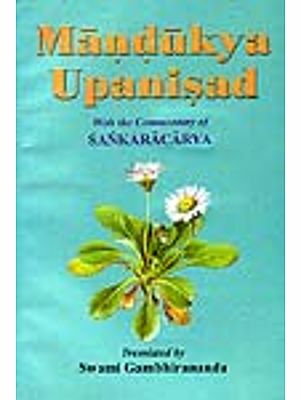 The German scholar, Deussen, opines that together with these four Prakaranas the Mandukya Upanishad is one whole work written by Shri Gaudapada, Prof. S.N. Dasgupta, M.A. Ph D, and many other modem scholars have declared that - (a) Among Shri Gaudapada's Prakaranas - especially the fourth one - many Prakriyas (methodologies) found III Buddhistic texts are to be seen; (b) since Shri Gaudapada came into the picture only after the famous Buddhist teachers like Ashwaghosha, Nagarjuna, Asanga, Vasubandhu etc., we have to perforce surmise that he too, in all probability, was a Buddhist, or else, he was a preceptor who had a great respect towards Buddha's teachings. Among these four different opinions of various groups of scholars, the last three seem to be mere speculations, for each one of them cannot stand the test of reasonable deliberation.